This sweet snack is produced in two different steps. -First, apples are cut in cubes and dehydrated, through a new technology called “freeze-dry“. It’s an innovative drying system that uses the temperature leaps, much lower than zero. -Secondly, dried apples are mixed together with apple fibres and concentrated apple juice; after that everything is popped! 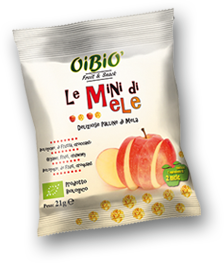 21 g of “Mini di Mele” (“Mini apples”) correspond to 2 fresh apples. During the production process apple juice can be replaced with many other juices, so we can always create a new taste. 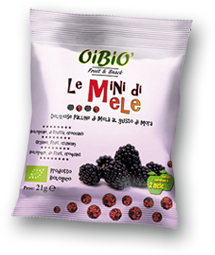 Eventually, we can produce this snack both with organic or conventional raw materials.